Background: Close contact investigation is the essential key in tuberculosis (TB) case finding and an effective strategy for TB control program within any society. Methods: In this prospective study, 1186 close family contacts of hospitalized TB patients (index) in a referral TB hospital in Tehran-Iran were passively studied. These people were studied to rollout TB infection and disease. Demographic characteristics, clinical and laboratory data of these individuals were reviewed and summarized for analysis. Results: A total of 886 (74.4%) close-family contacts completed their investigation. The index TB patients of these individuals were sputum smear negative for acid-fast bacilli in 137 cases (11.6%) and the rest were smear positive. A total of 610 (68.8%) close-family contact ruled out for TB infection or disease (Group I). A total of 244 cases (27.5%) had latent TB infection (Group II) and active TB (Group III) was confirmed in 32 cases (3.6%). A significant difference was shown for female gender, signs and symptoms, family size, and positive radiological finding between Group I and Group II. The study of index parameter including positive sputum smear/culture did not reveal any significant difference, but positive cavitary lesion significantly more has seen in active TB group (P = 0.004). Conclusions: This study emphasizes on sign and symptoms and radiological finding in TB contact investigation, where index parameters including positive smear/culture, does not implicate any priority. Although cavitary lesions in index patient have more accompanied by active TB, close contact study should include all of TB indexes. This investigation should include chest radiography for these individuals. Tuberculosis (TB) has afflicted humankind for centuries and remains an important global health issue. Meanwhile, despite the emergence of pharmacological anti-TB treatment in the last century, TB is still one of the leading causes of death from an infectious disease in the world., This issue has become even more evident with the emergence of HIV and AIDS in the recent years.,, According to the World Health Organization (WHO) report, the estimated incidence rate of TB cases (including HIV + TB) in Iran has been 14/100000 in 2016. The highest mortality rates from this disease are in developing and third world countries. The patients with a positive sputum smear are more to charge of transmission of Mycobacterium tuberculosis and this group of patients is always the main target in national programs of TB control in developing countries with a high TB rate, but they are not the only suspected resource. There are many studies to show that there is a greater incidence of TB in those who have had contact with positive smear patients.,,, Although it has also been shown in the several studies that it is possible to find transmission of TB among those who have had close contact with TB patients with negative smear or plural TB, it is evident that the most critical issue in controlling TB infection in the community is early diagnosis and treatment of TB patients. Consequently, each TB patient may cause a chain of transmission and therefore, infected patients should be diagnosed and treated for the disease as soon as possible. It is obvious that these patients are in a few main groups: individuals with increased susceptibility and high-risk behaviors such as incarcerated individuals, refugees, nursing home inhabitants, injection drug users, HIV-positive individuals, and close contacts of TB patients. Although there are no comprehensive global recommendation for close-contact investigation except children aged <5-year-old and people living with, or at high risk of HIV infection, the WHO has lunched the first international standard for the overall contact investigation in 2012. Close contacts primarily consist of co-workers, home visitors (friends and relatives), and family members living with the patients. Since it is not feasible to identify and study co-workers and home visitors, in this study, we have focused on family members living with the index patients who are both easily identifiable and have a longer and more significant duration of contact. Consequently, studying family members of host TB patients could enable us to control TB with detecting and treating undiagnosed TB patients. In a prospective study, 1186 close-family contacts of index TB patients hospitalized in Masih Daneshvari hospital in Tehran were passively investigated during 3 years (2011–2014) to evaluate TB status. This study was conducted with the approval of Masih Daneshvari Hospital ethic committee and utilizing protocols approved by the respective institutional review boards. All the patients have the written consent form, or verbal, if they were illiterates. At first, family members were informed about the TB disease and importance of contact investigation. They were not charged and were voluntarily visited by physician in the outpatient clinic. In this study, 453 patients older than 14 years of age with confirmed pulmonary or extrapulmonary TB admitted to Masih Daneshvari hospital were entered to study as index TB cases. Family members of these index patients were studied to rule out TB status. These close-family contacts were studied with predesigned questionnaires based on the existing information about the index cases. Both index and family member entered into the study if verbal or written consent were obtained. From these individuals, we obtained a history of present illness and pertinent past medical history before clinical examination. At least three sputum smear samples, tuberculin skin test (TST), and chest radiography were done for close contacts who were presenting with clinical symptoms of cough and sputum production. For individuals without clinical symptoms, at least TST and chest radiography were obtained. A TST reaction of ≥10 mm of induration was considered positive. TST boost test did not apply for any members. Also, converted TST from negative to positive was considered positive. Finally, TST positive and converted TST cases without any positive result for acid-fast bacilli (AFB) in direct sputum smear or culture were considered as latent tuberculosis infection (LTBI). Those with abnormal chest X-ray (CXR) findings had referred to performing lung computed tomography (CT) scan and if it was necessary, bronchoscopy was performed. CXR findings considered suspicious for TB including consolidation, infiltration, atelectasis, cavitation, hilar adenopathy, diffuse nodular opacities, and pleural effusion. CXRs were reviewed by at least two (infectious) specialist and all lungs CT scans initially were reported by a radiologist. If close-family contacts were diagnosed with TB or LTBI, an appropriate treatment regimen was applied. Both diagnosis and treatment were based on the WHO guidelines for TB treatment. The current study was approved by the ethics committee of Shahid Beheshti University of Medical Sciences, Tehran-Iran. The results of study summarized in three groups of study. Close-family contact that ruled out for TB infection or disease was considered as Group I. Individuals who were diagnosed as LTBI were considered as Group II and confirmed active TB were considered as Group III. These patients were studied in two patterns. In Pattern I, individuals of Group II (LTBI) were compared with Group I and in Pattern II, Group III (active TB) were compared with Group I. In this study, the variables consisting of age, family size, and area of the home were examined with the Kolmogorov–Smirnov test. All the variables were continuous. In Pattern I and II, LTBI and TB cases were compared with Group I by the Mann-Whitney U-test. Other variables were studied with the Chi-square test. In this study conducted over 3 years, 1186 close-family contact cases have been studied passively that 886 cases (74.4%) completed their investigation. The index TB patients for 798 individuals (90.1%) were sputum smear positive and the rest were negative for AFB. Also, the index TB patients for 638 cases (72%) had positive sputum culture for AFB. There were 318 cases (35.9%) with existence of cavitary lesion in the index cases [Table 1]. The mean of family size was 4.4 per index patients, with the range of 1–13. For 610 (68.8%) close-family contact, the existence of active TB and LTBI was ruled out (Group I). A total of 244 patients (27.5%) were diagnosed with LTBI (Group II). 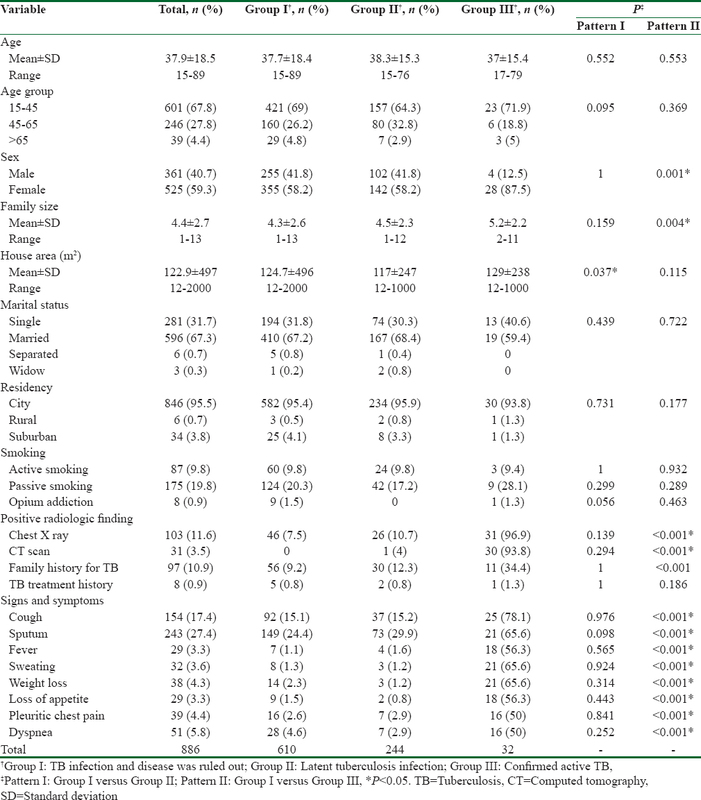 Finally, TB was confirmed in 32 close-family contacts (3.6%), of which 24 cases (2.7%) had a positive smear and 8 patients (0.9%) had a positive culture for M. tuberculosis [Table 2]. We have analyzed these cases in two patterns. The sputum smears, sputum culture, and cavitation of index patient were addressed in [Table 1]. Statistical analysis did not show significant difference between Pattern I and II in relation to smear scales, culture, and patient type of index TB, but revealed significant difference for cavitation in Pattern II [Table 1]. In addition, statistical analysis demonstrated significant difference in terms of female gender (P = 0.001), lager family size (P = 0.004), positive CXR, and CT scan findings (P < 0.001) and also, sign and symptoms (P < 0.001) in Pattern II. In Pattern I, only smaller house area demonstrated significant difference (P = 0.04). Studying close contacts of index TB patients is an effective and affordable way to identify TB cases and consequently control of transmission., Recent studies indicate that at most 1%–2% of these people contract clinical TB., This study emphasizes again those clinical and radiological findings are important in TB case finding, but index parameters such as having positive smear or culture for AFB, does not exactly forward us to finding suspected cases. Although cavitary lesions in index patients have more accompanied by active TB in family close contacts, close-contact studies should include all of contacts, especially in extended family and those who have signs and symptoms of disease should be undertake clinical review. This investigation should include CXR for these individuals. The completion rate of this clinical investigation has been 74.7% in our study. In Lee et al. study that has done in Hong Kong, only 215 cases of 4876 contact individuals (4.4%) refused to be evaluated, but in another study in Atlanta, U.S.A., 55% of close contacts completed the clinical study. However, the percentage of participating contacts will directly affect the identification of TB or LTBI cases and this highlights the role of the TB control team in encouraging these individuals, especially in passive case finding. In our study, the mean of family size has been 4.4. This is very close to another study in the USA  that the mean and the median number of close contacts were both 4. The completion rate and mean of family size could indicate the expected participant in actual setting, considering larger family size has been associated significantly with active TB in our study [Table 2]. Radiological finding, both CXR and CT scan, showed significant difference in active TB contacts versus noninfected group (Group I). This shows the necessity of chest radiological examination in contact investigation. Although the role of radiological investigation has been indicated in diagnosing TB in HIV/AIDS patients,, this issue is still controversial in TB case finding. In some studies, radiology was not an appropriate tool for TB diagnosis, especially in areas with a lower prevalence of TB,,, but in the other, like a study conducted in India, radiological findings were more credible than symptom screening in diagnosing TB. In the present study, a smaller home area was a risk factor for LTBI (P = 0.04). Although according to the Center for Disease Control in the USA, small spaced homes with small rooms and homes with poor ventilation are considered risk factors for increased transmission of TB, no independent study has been conducted in this field. Lienhardt et al. studied host and environmental factors simultaneously in three West African countries. The rate of TB showed a significant correlation with the male gender. Underestimation of disease in women due to less access to health services and stigma was given as a reason for the higher rate of TB in the male gender. Furthermore, in the recent studies, TB susceptibility genes have been identified regionally on the X chromosome which can justify the higher rate of TB among males gender. This issue confronts our findings [Table 2]. We suggest that in urban communities, women more adhere to medical advice than men; consequently, more women have completed their clinical follow-up (data not shown). In the study of signs and symptoms, all expected TB symptoms including >2 weeks cough, sputum, fever, sweating, weight loss, decreased appetite, chest pain, and dyspnea were significantly greater among TB patients. Nevertheless, none of these symptoms were significantly different among patients who had LTBI versus noninfected group (Group I). Therefore, any signs and symptoms should consider important in clinical follow up. Although this study has done in limited scale as passively case finding, it could addresses the remarkable results. First, this study shows even in limited resources settings, contact investigation could be valuable and feasible even in passively manner. The finding emphasize that in the setting with the lack of adequate resources, contact investigation should not be waived. Second, the present study indicates that there is not any priority in contact investigation of smear/culture positive indexes, but it should be implemented for all family contacts, especially in extended family and indexes with cavitation in radiography. In addition, at least chest radiography should be request for these individuals. Nathan C. What can immunology contribute to the control of the world's leading cause of death from bacterial infection? Immunol Rev 2015;264:2-5. Mitchison DA. Assessment of new sterilizing drugs for treating pulmonary tuberculosis by culture at 2 months. Am Rev Respir Dis 1993;147:1062-3. Corbett EL, Watt CJ, Walker N, Maher D, Williams BG, Raviglione MC, et al. The growing burden of tuberculosis: Global trends and interactions with the HIV epidemic. Arch Intern Med 2003;163:1009-21. Bhattacharjya C, Sahu D, Patel SK, Saggurti N, Pandey A. Causes of death among HIV-infected adults registered in selected anti-retroviral therapy centers in North-Eastern India. World J AIDS 2015;5:90. Dirlikov E, Raviglione M, Scano F. Global tuberculosis control: Toward the 2015 targets and beyond. Ann Intern Med 2015;163:52-8. World Health Organization. TB Country Profile-Report 2016. Available from: https://extranet.who.int/sree/Reports?op=Replet&name=%2FWHO_HQ_Reports%2FG2%2FPROD%2FEXT%2FTBCountryProfile&ISO2=IR&LAN=EN&outtype=pdf. [Last accessed on 2017 Nov 25]. Case KK, Hallett TB, Gregson S, Porter K, Ghys PD. Development and future directions for the joint United Nations Programme on HIV/AIDS estimates. AIDS 2014;28 Suppl 4:S411-4. Bemis K, editor. Identifying Tuberculosis Transmission from Smear-Negative Patients Using Genotype and Epidemiologic Links-Suburban Cook County, Illinois, 2009-2015. 2016 CSTE Annual Conference. CSTE; 2016. Shaw JB, Wynn-Williams N. Infectivity of pulmonary tuberculosis in relation to sputum status. Am Rev Tuberc 1954;69:724-32. Grzybowski S, Barnett GD, Styblo K. Contacts of cases of active pulmonary tuberculosis. Bull Int Union Tuberc 1975;50:90-106. Lohmann EM, Koster BF, le Cessie S, Kamst-van Agterveld MP, van Soolingen D, Arend SM, et al. Grading of a positive sputum smear and the risk of Mycobacterium tuberculosis transmission. Int J Tuberc Lung Dis 2012;16:1477-84. Shapiro AE, Variava E, Rakgokong MH, Moodley N, Luke B, Salimi S, et al. Community-based targeted case finding for tuberculosis and HIV in household contacts of patients with tuberculosis in South Africa. Am J Respir Crit Care Med 2012;185:1110-6. Hernández-Garduño E, Cook V, Kunimoto D, Elwood RK, Black WA, FitzGerald JM, et al. Transmission of tuberculosis from smear negative patients: A molecular epidemiology study. Thorax 2004;59:286-90. Diel R, Loddenkemper R, Zellweger JP, Sotgiu G, D'Ambrosio L, Centis R, et al. Old ideas to innovate tuberculosis control: Preventive treatment to achieve elimination. Eur Respir J 2013;42:785-801. Gilpin TP, Hammond M. Active case-finding – For the whole community or for tuberculosis contacts only? S Afr Med J 1987;72:260-2. World Health Organization. Recommendations for Investigating Contacts of Persons with Infectious Tuberculosis in Low and Middle-Income Countries. WHO/HTM/TB/2012.9. Geneva: World Health Organization; 2012. World Health Organization. Guidelines on the Management of Latent Tuberculosis Infection. WHO/HTM/TB/2015.01. Geneva: World Health Organization; 2015. Available form: http://apps.who.int/iris/bitstream/10665/136471/1/9789241548908_eng.pdf. [Last accessed on 2017 Nov 25]. World Health Organization. Treatment of Tuberculosis Guidelines. 4th ed. WHO/HTM/TB/2009.420. Geneva: World Health Organization; 2010. Available form: http://apps.who.int/iris/bitstream/10665/44165/1/9789241547833_eng.pdf. [Last accessed on 2017 Nov 25]. Dasgupta K, Schwartzman K, Marchand R, Tennenbaum TN, Brassard P, Menzies D, et al. Comparison of cost-effectiveness of tuberculosis screening of close contacts and foreign-born populations. Am J Respir Crit Care Med 2000;162:2079-86. Binkin NJ, Vernon AA, Simone PM, McCray E, Miller BI, Schieffelbein CW, et al. Tuberculosis prevention and control activities in the United States: An overview of the organization of tuberculosis services. Int J Tuberc Lung Dis 1999;3:663-74. Marks SM, Taylor Z, Qualls NL, Shrestha-Kuwahara RJ, Wilce MA, Nguyen CH, et al. Outcomes of contact investigations of infectious tuberculosis patients. Am J Respir Crit Care Med 2000;162:2033-8. Reichler MR, Reves R, Bur S, Thompson V, Mangura BT, Ford J, et al. Evaluation of investigations conducted to detect and prevent transmission of tuberculosis. JAMA 2002;287:991-5. Lee MS, Leung CC, Kam KM, Wong MY, Leung MC, Tam CM, et al. Early and late tuberculosis risks among close contacts in Hong Kong. Int J Tuberc Lung Dis 2008;12:281-7. Padyana M, Bhat RV, Dinesha M, Nawaz A. HIV-tuberculosis: A Study of chest X-ray patterns in relation to CD4 count. N Am J Med Sci 2012;4:221-5. Nguyen DT, Bang ND, Hung NQ, Beasley RP, Hwang LY, Graviss EA, et al. Yield of chest radiograph in tuberculosis screening for HIV-infected persons at a district-level HIV clinic. Int J Tuberc Lung Dis 2016;20:211-7. Webb RM, Holcombe M, Pearson MM. Tuberculosis contact investigation in a rural state. Int J Tuberc Lung Dis 2003;7:S353-7. Tornee S, Kaewkungwal J, Fungladda W, Silachamroon U, Akarasewi P, Sunakorn P, et al. Risk factors for tuberculosis infection among household contacts in Bangkok, Thailand. Southeast Asian J Trop Med Public Health 2004;35:375-83. Harries AD, Kamenya A, Subramanyam VR, Maher D, Squire SB, Wirima JJ, et al. Screening pulmonary tuberculosis suspects in Malawi: Testing different strategies. Trans R Soc Trop Med Hyg 1997;91:416-9. Gothi GD, Narayan R, Nair SS, Chakraborty AK, Srikantaramu N. Estimation of prevalence of bacillary tuberculosis on the basis of chest X-ray and/or symptomatic screening. Indian J Med Res 1976;64:1150-9. Self-study modules on tuberculosis: Contact investigations for tuberculosis, Center of Disease Control and Prevention, 2010. Available from: http://www.cdc.gov/tb/education/ssmodules/module6/ss6contents.htm. [Last accessed on 2017 Nov 25]. Lienhardt C, Fielding K, Sillah JS, Bah B, Gustafson P, Warndorff D, et al. Investigation of the risk factors for tuberculosis: A case-control study in three countries in West Africa. Int J Epidemiol 2005;34:914-23. Bellamy R, Beyers N, McAdam K, Ruwende C, Gie R, Saami P, et al. A genome-wide search for tuberculosis susceptibility genes in Africans. Proc Natl Acad Sci USA 2000;97:8005-9. Horne N, Davies B, Pines A, Somner A, Springett V, Stradling P, et al. A study of a standardised contact procedure in tuberculosis. Tubercle 1978;59:245-59. Lee KS, Hwang JW, Chung MP, Kim H, Kwon OJ. Utility of CT in the evaluation of pulmonary tuberculosis in patients without AIDS. Chest 1996;110:977-84. Yoder MA, Lamichhane G, Bishai WR. Cavitary pulmonary tuberculosis: The Holy Grail of disease transmission. Curr Sci Bangalore 2004;86:74-81.